It’s all around us. It’s getting louder. Modern machinery, automobiles and devices have transformed our environments into places of persistent loud noise. While sitting in your home you may feel safe, but as soon as you go out, there are lawnmowers, semis, airplanes and more creating a whole lot of racket all around you. Fortunately, you can protect your hearing from this cacophony and prevent hearing loss. Here are simple, yet important, steps you can take to prevent hearing damage. It all starts with getting informed about what’s too loud. Here’s a quick chart. 85-90 dB = yelling, lawnmower, highway traffic = No more than 2 hours exposure. 100 dB = motorcycle, gas-powered lawn tools, factory machinery = hearing damage occurs within 15 minutes. Think these things really aren’t this loud? Or want to test other noises? Download a free sound meter on your smartphone to run some tests. Run your tests from the normal distance you would stand away from the source because sound gets quieter the further you are away. You may have been doing it your whole life. And your whole life you’ve been slowly damaging your hearing. But there’s no reason to continue. Research headphones before you buy them. Some can exceed 100 dB. That kind of volume is unnecessary and can damage your hearing within 15 minutes. After all, most people listen to music more than 15 minutes. Earbuds are even worse. Today, 1 billion children are at risk of permanent hearing loss because of misusing earbuds. Never turn earbud volume up over 50% of the total volume. If you can’t hear it well at this level then you’ve already got significant damage. If you live in an apartment or have a neighbor who obsessively mows the yard, it’s tempting to try to tune it out. Or maybe you try to listen to music while you mow your own lawn. But know that if you’re using your music to block out background noise, your headphones are probably at an extremely high setting. Get noise-canceling headphones or wear earplugs instead. 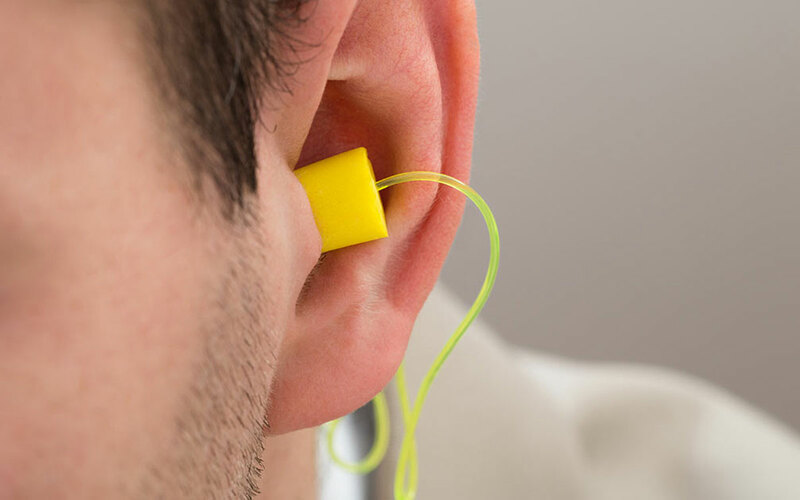 Get used to wearing earplugs if you will be exposed to loud noise for a period of time. If you work around loud sounds, always follow your safety guidelines. Don’t listen to people at work who say “it’s not really that loud here”. They have already significantly damaged their hearing. They can’t hear how loud it is anymore. They’re well on their way to permanent disability. You don’t want to join them. If you can move away from loudspeakers, machinery or other sources of loud noise, make the active choice to find a better place to be. Remember, putting distance between yourself and the sound reduces how loud and damaging the sound is. According to a handy online hyperphysics calculator, If you move 20 feet away from a sound that is 110 dB loud, the sound reaching your ears is about 100 dB. That’s safe for about 15 minutes. So what about fireworks? They don’t explode until they’re up in the sky. Fireworks exceed 150 dB. The average firework goes up 120 feet before it explodes. According to the calculator, those on the ground near the launch site will experience 124 dB of sound. That’s still instant damage. But If you and your family were to sit 2000 feet away, about 5.5 football fields, the noise would be under 100. That’s considered safe for short-term exposure. Chances are that you haven’t protected your ears 100% of the time and some permanent damage has already occurred. Nearly 1 in 10 people ages 55-64 have disabling hearing loss. That rate more than doubles as someone approaches 70. Ignoring or trying to work-around your mild to moderate hearing loss will cause the hearing loss to progress more quickly to disabling levels. But the great news is that getting your hearing tested and speaking with a hearing specialist gives you highly effective options for treating hearing loss and preventing further damage. One of the reasons disabling hearing loss rates are so high is because people wait on average 7 years too long to seek treatment. Don’t wait. Schedule a hearing test today.